I don’t think there is any arguing with the fact that we live in an instant gratification oriented society. I certainly know it’s true in my life of internet shopping and instant music downloads to my iPhone, but there is one area where I try my hardest to leave that fast-paced lifestyle behind – the kitchen. I am a card carrying member of Slow Food USA and, as mentioned before on this blog, would probably be quite happy spending my days curing prosciutto in my basement and experimenting with cheese cultures for the different blues and triple creams ripening in my fridge, but the truth is I just don’t have that kind of time. The majority of us have to work for a living so those projects must wait for the occasional, lazy weekend day. Making food and food products from scratch at home is no longer a necessity to be able to eat, but a luxury for those who have the time. Since I don’t have time to be my own cheese maker, farmer or butcher, I have done my best to find a happy medium. I do grow some of my own vegetables and what I don’t have time to do myself, I try to purchase from the artisans who are taking the time and care to do it right (farmers markets, small batch cheese producers, etc.). This doesn’t mean I’m never at Ralphs buying blueberries shipped in from Argentina. It just means I make an effort not to be there, but when I am, I don’t feel guilty and neither should you. My favorite happy medium of the summer is refrigerator pickles. They’re quick and easy for the home cook who wants a pickled vegetable by next weekend, but doesn’t have the time or desire to make sure that there are pickles put up for the whole winter. It was quite satisfying and easy with pickled radishes from my own garden and even easier with my recent batch of pickled cucumbers, made from cucumbers purchased at the farmer’s market. After I picked up two pounds of bright emerald green pickling cucumbers, I went looking for a good way to use them. Most of the recipes I found were intended for huge batches of pickles that were headed for a canning bath and wouldn’t be ready to consume for at least a month. I wanted pickles and I wanted them a lot sooner than in a month. I also wanted to be able to spend the evening with my boyfriend and not gently lowering and lifting canning jars in and out of a pot of boiling water. Instead, I mixed up a basic brine, cut the ends off my pickling cucumbers to allow the brine to quickly penetrate the cucumbers, poured the vinegary liquid over the cucumbers and let them sit, first on the counter and then in the refrigerator. Five days later I had wonderful crispy perfect pickles. Five days may not seem like instant gratification in your book, but compared to a month or two for the canned variety, I was happy. So were the rest of the pickle eaters at my BBQ the next Friday night. We all sat around a bonfire, happily crunching on some of the best pickles any of us had ever had and these are the folks who taste more of my food than anyone else. I can tell when they’re lying, and they were not. Rinse the cucumbers, dry thoroughly and chill in the refrigerator for at least two hours. If you've been keeping your cucumbers in the fridge, you can skip the drying and chilling steps. Heat the vinegar and three cups of water in a small saucepan and stir in the salt until dissolved. Set the vinegar mixture aside to cool just slightly. 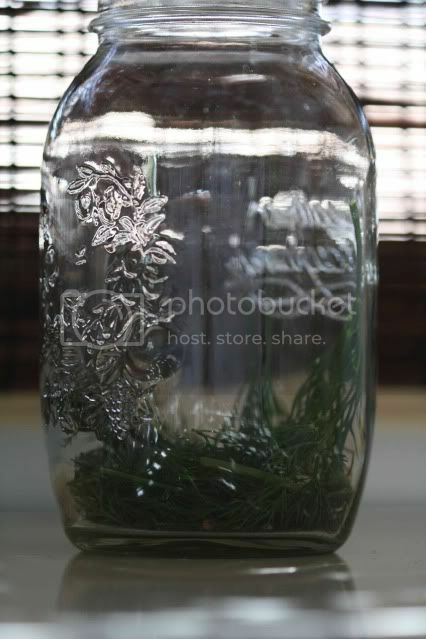 Place a few dill sprigs at the bottom of the jar along with the garlic cloves and half the mustard and coriander seeds. Cut the stem and blossom ends off the cucumbers (an eight of an inch is all you need to remove) and place them in the jar. Pour the vinegar mixture over the cucumbers, adding more water as needed to cover. 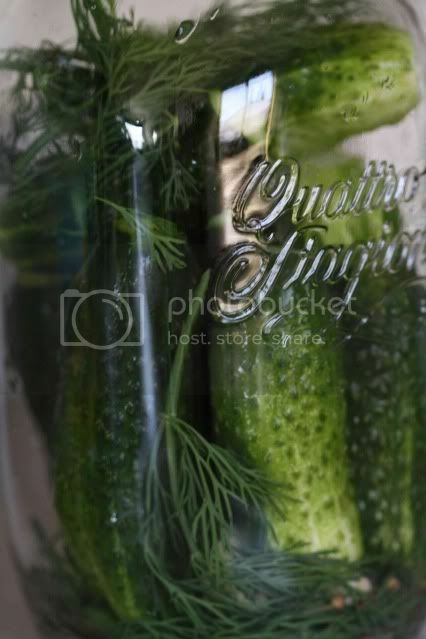 Place a few more sprigs of dill and the remaining coriander and mustard seeds over the cucumbers. 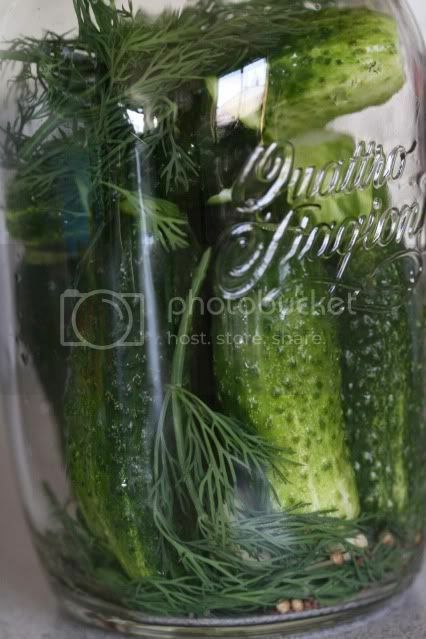 If the cucumbers are not fully submerged, add more dill to force the cucumbers fully under water. Leave the jar on the counter for two days and then place in the refrigerator for two to three days more. Enjoy the pickles within a week of opening the container. These sound absolutely delicious. The best part of pickles cured this way is that they keep much of their color and all of their crunch. This is a really nice recipe. Thanks for sharing this recipe! I'm going to try this one soon! I've always wanted to make my own pickles but was intimidated. This recipe makes the prospect not so ridiculous. Thank you! what a lovely happy medium. I prefer crunchy pickles, anyway. May just try my hand at pickling if I find some good cucumbers at the market this weekend. Thanks for the recipe! Thanks for the informative and fun to read post! I am a pickle fanatic! I love the idea of making my own! I have never made pickles before but now I must!! I am so with you! I love cooking and baking from scratch and only have the time on the weekends, unless I break the process down into several evenings during the week. Buying and freezing or canning fruit is great but sometimes I also want fresh raspberries or blueberries in the winter time for a specific recipe and will go to the store to buy them from where ever. I love how you stated not to feel guilty for having to find a middle ground. Good for you and it is about time that statement was typed out loud! These pickles sound soooooo yum! I've recently re-located to the UK and really miss crunchy yummy pickles from county fairs! Defo going to try these next summer when I try my hand at growing my own cucumbers! Cheers! I've never tried to make pickles- but these look marvelous! Great job! Just in time! Thanks for the recipe. I'm impressed that these can be made in 5 days! :) I've been seeing a lot of preserves, so it's nice to see a post on pickles! Sounds like a great solution - five days and cruncy pickles. Yum. I will have to try this next time I see those gorgeous baby cucumbers in the markets. Yay!!! I am making pickles today!! Thanks for this post. It really stirred up some great memories of canning with the women of my family. For a spicy variation try adding just a pinch or two of red pepper flakes or a dried red chilli. We'd always make a few jars of sweet bread and butter pickles for my uncle. Well, I guess I'll be making pickles soon. Thanks again!